*Thank You very much for Yourproduct. For years I have been suffering with itchiness, there,, and going to see doctor is just not done when it comes to certain ailments.By chance I have found You on the web and I am I heaven-literally. I will not be buying anything else and just to have a good night sleep is like the next best thing since sliced bread. So thank you very much helping me and ” few” other in the same situation. I will swear by it-only the best and nothing else for me.Just ordered second lots-first lasted about 5-6 mths so value for money is excellent, but non itchy… is worth more than that. Thanks again. As regards the product (which is the real reason that I write) I am happy to report that having used the product, my own issue has been brought under control, resulting in (despite having two unused tubes) a complete eradication of my issue... I will of course keep the surplus tubes just in case there is ever a return of the problem that I had.. but months have now passed since I last required the cream... I am totally amazed at the outcome..
*The word miraculous is the only word I can think of that sums up your product and that probably does it a disservice:-) B.F.
*I have had a long running episode of the piles and creams from the Doctor were sore and itchy and didn't work very well. This arrived on the Tuesday I think and within a day the itching and stinging cleared up. The cream also stopped the bleeding and started to heal. Within one week I am almost cleared up, great product. *I used Analcare whilst I was having chemotherapy to treat breast cancer. One of the common side effects of treatment is constipation which left me with very painful piles. The cream is really effective at soothing and reducing inflammation, none of the treatments prescribed by the Dr worked. My mum recently had a stroke and is chair/bed bound, the amount of medication she is taking and the lack of movement has resulted in severe piles. This cream is the only one that gives her relief from the symptoms. 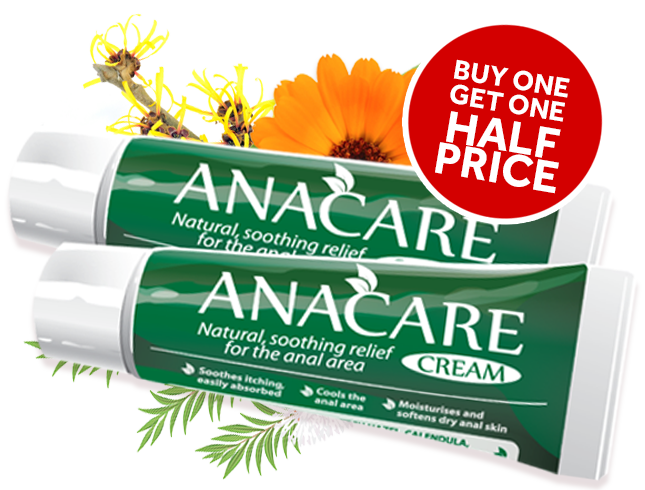 I highly recommend Analcare above all other pile creams. Well done on producing this amazing product!